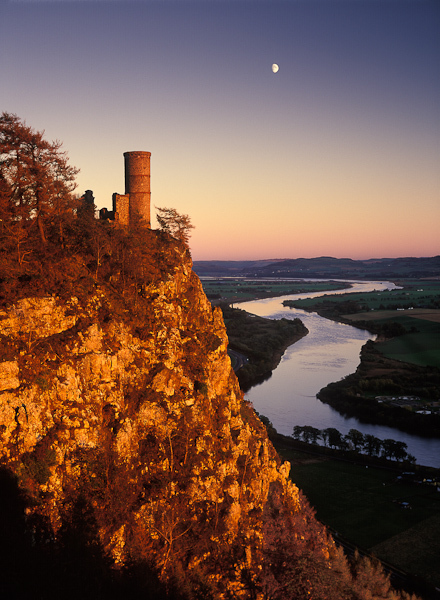 Kinoull Hill sits just outside of Perth, overlooking the River Tay as it meanders down to the North Sea. The structure on the cliff edge is a folly and was built as a ruin by the 9th Earl of Kinoull in the 18th century. It was meant to resemble the castles on the Rhine in Germany. I had to work quickly as the light from the setting sun was already off the low lying land and was creeping up the cliff face. With a bit of forward planning, I knew that the moon would be in the right place at this time. Photo © copyright by Graham Chalmers.